How should I support my son in his discernment of the priesthood? The main thing is to be understanding and encouraging. Ask him how you can assist and support him. This question alone will mean so much to your son, and will reveal your unconditional love to him as he strives to pursue the Lord’s will. Respect his privacy and ask him whether you should keep his discernment confidential for the moment. It would be helpful – both to you and to him – if you were learn more about his vocation. There are many useful resources on this website to learn more about discernment, seminary life, and the priesthood. Most of all, pray for him! Give thanks to God for his life and ask the Lord to assist him with the grace of clarity and courage in following his vocation. How long would his formation take? Depending on his age and educational background, it will take between four and eight years to become a priest. One of the main reasons why it takes so long to become a priest, aside from all the intellectual formation that is needed, is to give a man plenty of time to ensure that it is the right path for him. What would be my financial responsibility for his college education or formation? It is the intention of the Archdiocese that, whenever possible, financial considerations would never prevent a man from pursuing a call to the priesthood. However, for seminary acceptance, it is encouraged that a seminary candidate has a limited amount of debt incurred from college. The Archdiocese of St. Paul and Minneapolis Office of Vocations encourages men discerning seminary with significant college debt to enquire with the Laboure Society. 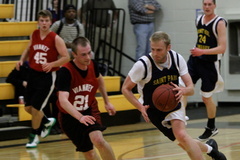 For college seminary, the Archdiocese pays room and board for each archdiocesan seminarian. 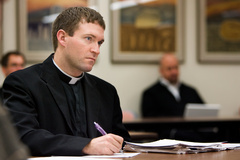 For Theology seminarians, the Archdiocese pays seminary, room, board, tuition and any required fees on behalf of each seminary. Any additional costs are the responsibility of the seminarian, including the cost of books. How often will I see him? If your son’s discernment leads him to enter seminary, his departure will be similar to a son leaving home to attend college or to enlist in the military. There will be an inevitable transition period for each of you. He will most likely make visits home during Thanksgiving, Christmas, and over the summer vacation each year. Throughout his formation in seminary, he will be encouraged to maintain and develop family relationships through periodic visits and by frequent communication. Will he be happy? Will he be lonely? The overwhelming majority of priests are extremely happy in their vocations. Why? Because they are doing what the Lord intended for their lives. Most priests will cite administering the Sacraments, preaching the Word, and helping people and their families as great sources of satisfaction. Ultimately, the source of happiness for any child of God is his or her relationship with Jesus Christ and the priest is given the privilege of acting in the person of Christ at key moments in the life of the Church. Studies consistently show that priests are very happy in their ministry, in far higher percentages than those studied in virtually any other life work. One recent and exhaustive study of the priesthood was done by Msgr. Stephen Rossetti, who published his findings in the very readable Why Priests Are Happy: A Study of the Psychological and Spiritual Health of Priests. It is important to keep in mind that there is a difference between aloneness and loneliness. In the life of a priest, moments of solitude or aloneness are required for prayer, reflection, homily preparation, and rest. Many priests experience aloneness without feeling lonely. Further, in the midst of his ministry, a priest interacts with hundreds of individuals a week, and many life-giving friendships are enjoyed. Still, no vocation, even marriage, is immune to loneliness. Therefore, a priest must always be vigilant in maintaining healthy relationships with family, friends, brother priests, religious brothers and sisters and parishioners. What if he leaves the seminary? It is possible that your son could spend as few as five days or as many as a five years in seminary and discern that the priesthood is not for him. There is nothing shameful about withdrawing from a program for this reason. The time spent in formation should never be considered a waste. Your son will have grown in holiness, self-awareness, and in personal maturity through the entire process of discernment and his time in formation.